This is a multi-layered tale of historical detection; incorporating oral testimonies, recorded histories, official documents, letters, diaries, dreams and prophecies. As a novel, it presents a carefully crafted and insightful revision of actual events, offering a courageous departure from mainstream historical writing. Set against a contemporary backdrop, the main protagonists (Sonja Haas and Jason Tomas) travel through Portugal, Spain, France, Switzerland, then on to Holland and England before returning to South Africa. Via various roadside encounters, including the startling revelations of a sangoma (a healer empowered by ancestors), they reconstruct the past and their own identities, with divergent consequences. 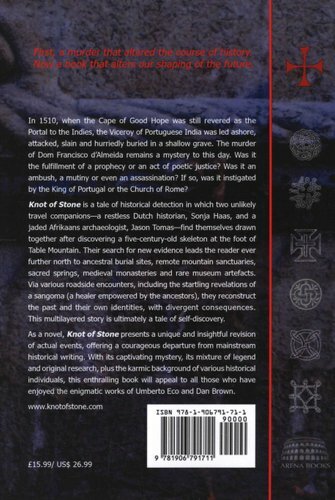 When the Cape of Good Hope was still revered as the Portal to the Indies - the Viceroy of Portuguese-India was led ashore, attacked, slain and hurriedly buried in a shallow grave. The murder of Dom Francisco d'Almeida remains a mystery to this day. Was it the fulfilment of a prophecy or an act of poetic justice? Was it a mutiny, an ambush or perhaps an assassination? If so, was it instigated by the King of Portugal or the Church of Rome? These are the questions which Sonja and Jason set out to answer. As the main focaliser, Sonja's inner conflict reflects a passage from doubt to hope, echoing the transition from a Cape of Storms to the Cape of Good Hope. 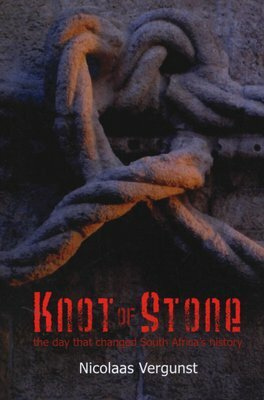 Like Sonja's search for herself, Knot of Stone is ultimately a tale of self-discovery. With its captivating mystery, and mixture of legend and established fact, and the karmic background of various well-known individuals in interpreting events, this is an enthralling book which will appeal to all those who have enjoyed the Dan Brown literary genre.